The global polymer emulsions market is expected to witness an estimated CAGR of 5.95% for the forecast period of 2018–2023. One of the major drivers for the growing demand in this market is the increasing environmental concern around the globe and government policies encouraging environment-friendly products. The main advantage of polymer emulsion products is that they do not contain any VOC in them. Solvent-based compound release VOCs (Volatile Organic Compounds) into the atmosphere, which is not only harmful to the environment but also for human beings and various other forms of life. So polymer emulsions act as a substitute. The rising demand for water-based solvents or water-based coatings in the construction and automotive industries is one of the key factors boosting the demand for the polymer emulsions market. Strict environmental regulations and norms laid down by the various governments, along with social awareness regarding the go green concept are the key socio-political factors driving the polymer emulsion market. The high cost of R&D and volatile prices of raw materials are some restrains. Environmental regulations on butadiene is also likely to hamper the market growth during the forecast period. The paints & coatings segment of the global polymer emulsions market was the largest application in 2017. Recovery of the construction industry in countries, such as Germany, Sweden, United Kingdom, and China is the key factor expected to boost the demand for paints & coatings, therefore for the global polymer emulsions market. Additionally, the rising automotive sales, primarily passenger cars due to the increasing population in Asia-Pacific is augmenting the demand for paints & coatings, which, in turn, has a direct impact on polymer emulsions. Globally, Asia-Pacific will be the leading region for the polymer emulsions market. The region is likely to expand at a faster rate during the forecast period, due to the increased economic and industrial development in the emerging economies, especially in China and India. Urbanization and collaboration with European companies are the major factors boosting the building and construction industry in the Asia-Pacific region. Also, China is a major hub for the production of automotive, which is in an expanding stage. 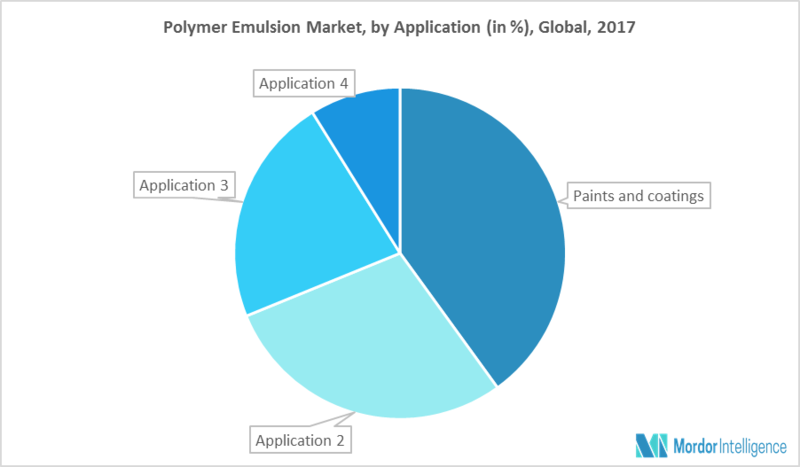 Simultaneously, these industries are the major consumers of emulsion polymers, therefore increase in these industry leads to increase in polymer emulsions market. March 2018: Lubrizol inaugurated new lines in Songjiang to serve the growing demand for TPU and specialty compounds. August 2017: AkzoNobel to focus on mass brands, new niches to push growth. Major Players: 3M, Clariant, Royal DSM NV, AkzoNobel N.V., Arkema, Celanese Corporation, Nuplex Industries Inc., and Sumitomo Chemicals, among others. To understand the impact of end-user applications on the market. Countries expected to witness the fastest growth during the forecast period.